Two men named as suspects in the poisoning of a Russian ex-spy in the UK claim they were merely tourists. The men, named as Alexander Petrov and Ruslan Boshirov, told the RT channel that they saw the cathedral, before returning to London by train. They are accused by the UK of trying to kill Russian ex-spy Sergei Skripal and his daughter Yulia. 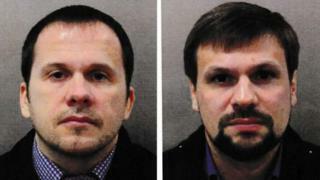 The UK has described them as agents of Russia’s military intelligence service, the GRU. “The town was covered by this slush. We got wet, took the nearest train and came back” to London, they told RT. The UK’s Crown Prosecution Service have said there is enough evidence to charge the men, who are understood to have travelled to London from Moscow on 2 March on Russian passports. Two days later, police say, they sprayed the military-grade nerve agent Novichok on the front door of Mr Skripal’s home in the Wiltshire city of Salisbury, before travelling home to Russia later that day.